Nala has a home! 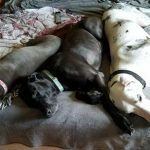 - Rocky Mountain Great Dane Rescue, Inc.
Nala has a home with her Foster Family, in Idaho! Laura and Ron, along with their 3 children, Tyler, Bristol, and Phoebe, are beyond excited to welcome Nala as their newest family member! Laura and her family have fostered for us before, but when they met Nala, they knew they would become Foster Failures. Bristol & Phoebe adore Nala, and the feeling is quite mutual. She follows the girls everywhere, and even enjoys the occasional tea party! Nala will share her home with four fur siblings, Roo a 9 year old Chiweenie, Zoey, a 1.5 year old Great Dane, Bella, a 2.5 year old Pit Bull, and Kiki the cat. There are even chickens and cows for Nala to visit with, so she will not be short on company or playmates. Nala will have lots of land to run and play on with her new family, and will go everywhere they go, even on family vacations! We couldn’t be happier for Nala and her new family! Way to go sweet girl!